Dogs require two types of fatty acids in principle: saturated and unsaturated fatty acids which in turn occur can be subdivided into monounsaturated and polyunsaturated fatty acids. Polyunsaturated fatty acids include Omega-3 and Omega-6 fatty acids. They are essential (cannot be formed by the organism itself) and indispensable for the metabolic process. They must therefore be supplied through the daily food intake. Many simple dog foods now predominantly contain Omega-6 fats. Good dog foods complement Omega 3 fatty acids by the addition of fish oil, for example (for EPA and DHA) or linseed oil (alpha linoleic acid). Fish in particular (fish oil) is rich in natural Omega-3 fatty acids. 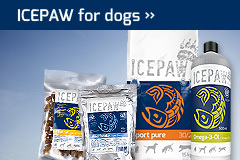 Salmon, herring or cod are therefore ideally suited as a dog food and source of fatty acids. However, it is also crucial that both fatty acids are provided in a balanced ratio. 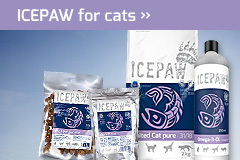 For ICEPAW products, we ensure a ratio of 1:4 (Omega-3/Omega-6) to ensure optimum positive effects. Essential fatty acid requirements are individual for every dog and can vary widely dependent on the age and life situation of the dog. Active dogs which participate in sports require considerably more energy than dogs with average activity levels. Care must be taken to ensure an adequate intake of essential fatty acids in dogs with above average activity levels in particular.